This very well known vegetable belongs to the root and tubers family of vegetables. Carrots are the most common ingredient in our daily cooking. We use them for salads, boiled vegetables, sambar, sabzi, cakes and pastries etc. Carrots have many healthy benefits. • The chemical composition of carrot shows that it contains anti-fungal properties. Hence, it can act as a medicine for any fungal disease. 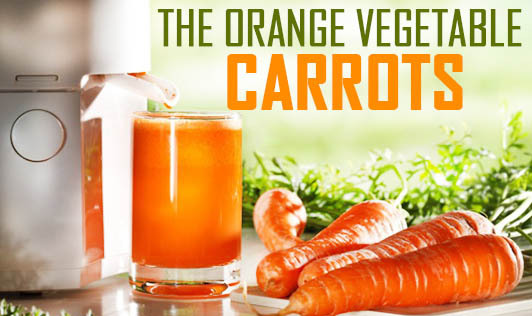 • Carrots are rich in beta carotene which naturally gets converted into vitamin A in the body. Hence, it is good for the skin, hair and eye health. • A medium sized carrot contains about 25Kcal of energy. A weight watcher can easily include this vegetable in any of his low calorie preparations. • The anti-oxidant property of carrot prevents you from looking old and also from developing cancer (anti carcinogenic property). • Carrots have properties that are known to prevent digestive problems, urinary tract infections, and tonsils. Carrots also contain sugars such as sucrose, glucose, xylose and fructose; hence a person with diabetes can eat carrots in limited quantities. Carrots can be given to children in the form of salads or be incorporated in lunch box recipes. Carrots with curd and other vegetables in the form of raitha, carrots with sprouts and corn and other dessert recipes can be a good snack for a weekend party.